mini wardrobe for me | escaped. Just a few days ago, I came across a site promoting “capsule wardrobe” – defined as a mini wardrobe made up of really versatile pieces that you love to wear. The writer/brain behind the concept says she was fed up of all her unnecessary purchases that always ended up either too big or too small or too so-not-her; that the unnecessary purchases were driving her insane. I can relate with that. Just last week, I walked out of Uniqlo with a brand new soft pink pants, with elastic waist, thinking I could fit into them considering the waist (still won’t give in to another maternity pants lol) – but the first day wearing it, I couldn’t wait to go home to change. The elastic waist was apparently too small for my 6-months pregnant belly and I was fidgeting in my seat the whole day, it was so uncomfortable! So I decided that the pants had to be somewhere in the wardrobe until I give birth and get my normal belly back. Which is in another 4 months? Spent my free hours during the day reading her experience, and it gave me some sort of liberation. Felt like a smack in the face, because just a few weeks ago I decided to spring clean my scarves; selling off all my dUCkscarves bamboo cotton (because I don’t wear them anymore) and you know how much I earn from the sale? That amount, coming from a set of scarves I didn’t even think of letting go before – and had been sitting in my wardrobe for months without being touched. So glad I finally decided to let them go. 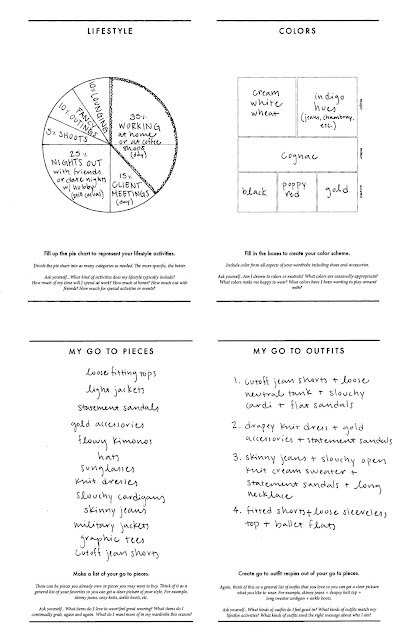 She made a capsule planner so that it'd be easier to identify the style we're comfortable with and to carefully select which pieces to be in the mini wardrobe. It's supposed to be seasonal, meaning you can change the pieces every 3 months - permitting you to either use the existing ones or go shopping, and stick to those 37 pieces for everyday style. Which means you'd allow yourself to be more creative than usual! Now, reading Un-Fancy sparks my interest in trimming down my wardrobe again – this time, I’d focus on clothes. The author said there’s no need to set the 37 pieces on stone, so settle on a number that caters for your daily personal style (she stressed that everyone should enjoy doing this rather than following the rules). No shopping for 3 months? Bring it on. For a start, you can read about capsule wardrobe here and here.